What a fun 8 nights we had for Hanukkah! 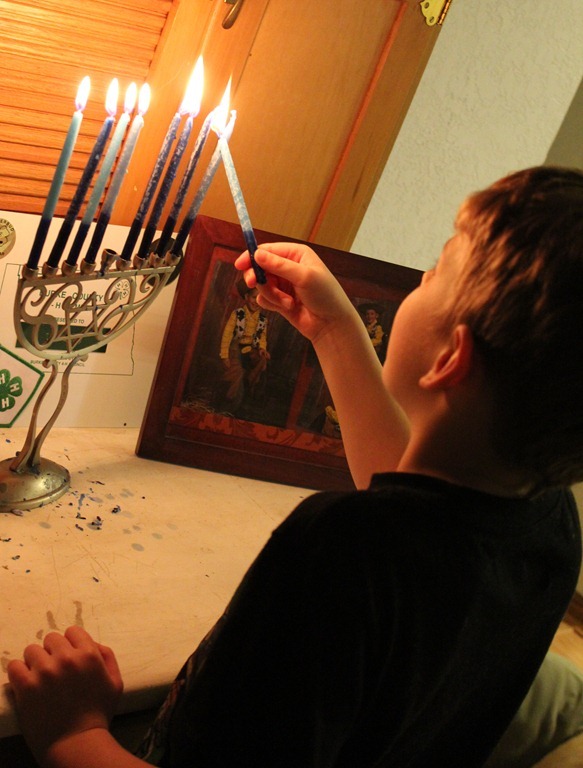 My son loved lighting the candles and saying the blessing each night, and I was so proud of him. I got a few questions from friends about if we give our son gifts on each day. My answer to this is a big fat NO! This year my kid turned into your typical little materialistic child. I think he hit and new record on the words “I want” this year. I’m determined not to let him get worse, and I’m hoping to nip this problem in the bud early. Most Jews that I know make it so you are giving more than you are getting. This is what I was taught too. Our son only got 1 gift for Hanukkah, and he was very excited about it, and he didn’t ask for more (big sigh of relief from me…we still have Christmas left so he will get a few on that day too). The rest of the days were focused on him giving gifts to friends, neighbors, family, pets, and a charity of his choosing. He and I had a great time giving to others and watching their faces light up with smiles. Now, he is already talking about what he is going to give to others next year! I already gave you a few recipes from our first night of Hanukkah, but I didn’t write up how that first night went, because I’m just now getting over being a bit ticked off about a cute stunt my hubby pulled. I ended up having to clean and prepare the veggies for the evening in our guest bathroom, and here is why: my husband brought in dead birds and put them in our sink to thaw. Yup that is right! 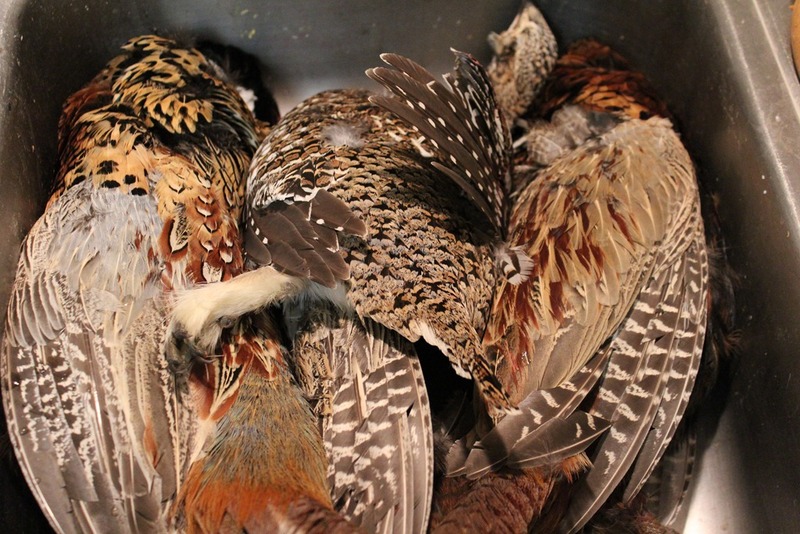 The 3 pheasants and 1 grouse he killed earlier in the day froze before he got home, and he needed them to thaw before he could clean them. See pic below in case you don’t believe me. Just to let you know, there are no bugs or diseases on them at all. They are as organic as you can get. I also made my husband scrub that sink till I could see my reflection in it. Now, this gets better…Of course I objected to this whole thing, but I did not get my way. Well, thankfully the barbeque brisket was already in the crock pot and the baked blueberry doughnuts were all done. The only thing left was the cheesy garlic polenta (see recipe below) and roasted veggies. Since I had 2 hours before I had to start making the rest of the dinner, I went downstairs to watch a movie with our son and my hubby left for work. Sadly I should have thought that having 3 bird dogs and 4 dead birds in the house would equal a problem. Well, I came upstairs halfway though the movie to check on the brisket and found a sink with only 1 pheasant in it. I then walked around the corner into our living room to find all 3 furbutts having their own Hanukkah feast! I did not take a picture of this. Just imagine feathers everywhere! Thankfully they were not that far into their feast and were kind enough not to have made a bloody mess! I had caught them just before it could have gotten really ugly. I shall leave the story there. I’m sure most of you know what kind words I had for my husband. Other than that little bird blip in our 8 days of Hanukkah, we had a great time! 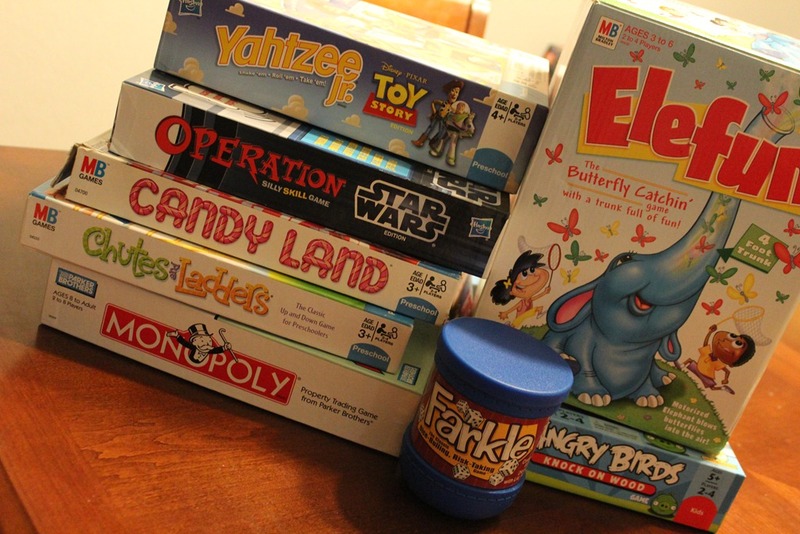 My favorite was each night we had a game night. Although, we still seemed to play Farkle every night along with whatever other game we chose. We all had a ton of fun playing different games each night, and I finally won a few games too! 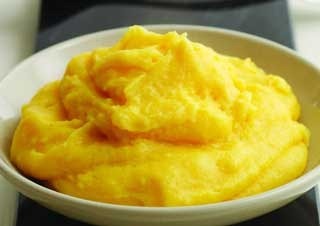 On to that polenta or grits recipe (in the south they are called grits and everywhere else, polenta). I have my wonderful friend in Florida to thank for pointing me in the direction of garlic cheese. Yup! Garlic cheese!! It is as good as it sounds. I love using it in pasta dishes and pizza the most. Never once did I think to use it in polenta. Thank you Judy for your wise ways in cooking!! Shred the cheese. Then, add the chicken broth and milk to a medium sauce pan and bring to a boil. Reduce the heat to low and add the polenta. Constantly stir until it has thickened. Watch out for the bubbling polenta…it likes to “pop”. I just stir really fast to keep it from “popping” at me. Once the polenta is good and thick, remove from the heat and stir in the shredded garlic cheese. Serve immediately! 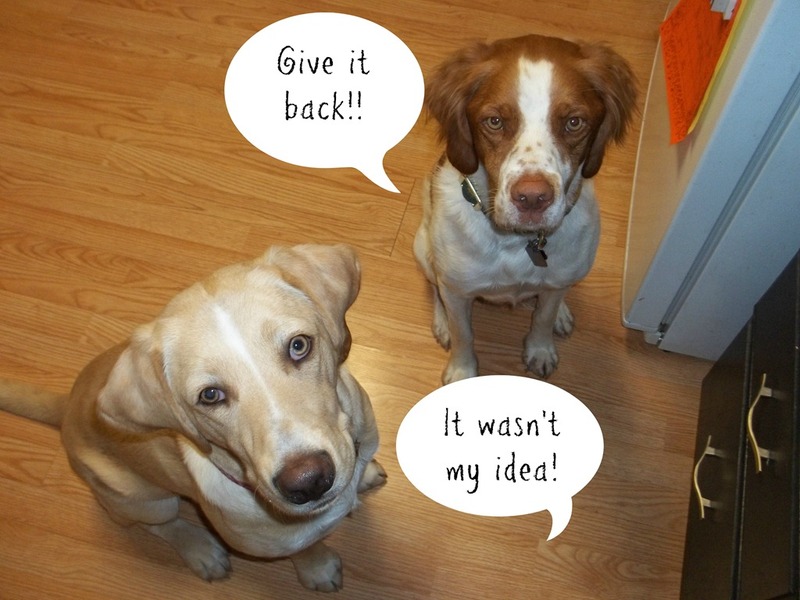 This entry was posted in Furbutts, Recipes, Side Dishes and tagged cheesy garlic polenta, hanukkah on December 16, 2012 by fromfltond. Oh my goodness, I can only imagine the mess the dogs made with the birds! Thankfully it was just feathers and nothing gross. I was sucking up those feathers for 2 day with my vacuum. Oh man! The birds in the house! Our old dog used to catch morning doves, completely defeat her then, and leave them on the back porch- no teeth marks. Pretty much her one claim to fame. LOL!! Glad she didn’t leave you too much of a bloody mess. Man that had to be fun to deal with. It’s a Hannukah miracle! Oy. I would have been more than pissed. My girls got presents every night and I’m think that is going to need to stop for next year. Plus, they still have Christmas too. It is hard to do both holidays each year. I’m still trying to find the perfect balance. Do you celebrate on all 8 days? We always lite the candles each night, but I kept it small in the celebration department this year. It gets exhausting with both Hanukkah and Christmas.